Hot air brushes and stylers work wonders for silky smooth hair, and they can also be used for perfect curls. Read on to find out how. Wash your hair and condition it as you would normally, but make sure to also apply a small amount of smoothing serum. Run the serum into your palms and through your hair. Next, brush your hair with a regular brush and divide it into sections; use pins to hold the sections in place, and let them down one by one as you smooth your way through your hair. Use the hot air brush slowly, and start at the roots, from the underside of your hair. Then, once you have completely air brushed the bottom section, move to the top section of your hair. When you are done, wait for your hair to cool completely. Only then can you brush it one more time with a regular brush, and finish it off with a sheen spray; the spray will help make your hair even smoother. Browse Hot Air Stylers to get more tips and tricks. When you want to curl your hair faster than with a curling iron, a hot air brush is your best bet; it also causes less damage. First, you will have to prep your hair, especially if it is straight. Use volumizing shampoo and conditioner, spray and gel to make sure the curls will hold. For best results, apply volumizing sprays or gels evenly on wet hair, at the roots. Then let your hair air-dry. Once it is damp (about 80% dry), it’s time to comb it carefully and finally use the hot air brush. Allow the brush to heat up, and in the meantime divide your hair into small sections. Start curling from bottom up, and make sure to work through each and every section. One by one, wrap the roots of each section of hair over the hot air brush, pulling it outwards and slowly rolling it inward at the same time; make sure your hair curls around the brush. 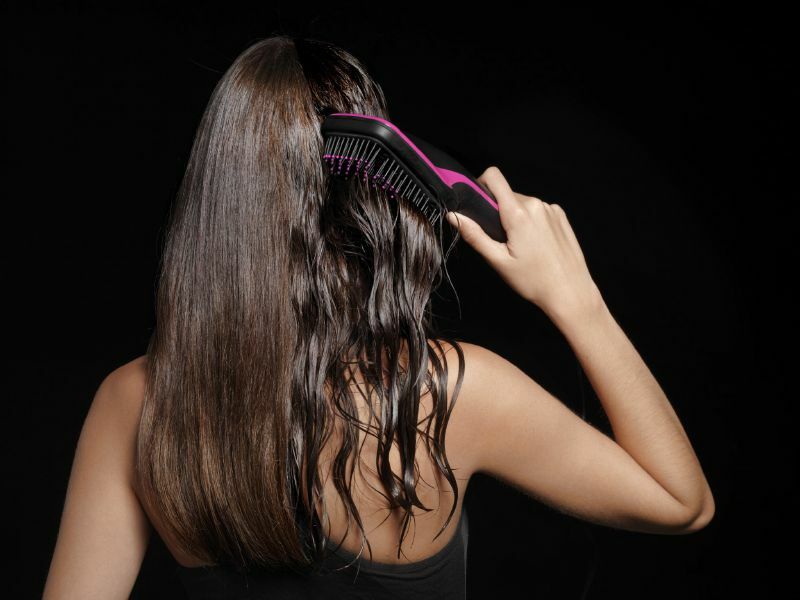 Use a regular brush as often as needed in order to detangle your hair throughout the curling process. Note that if your hair is short, you may not be able to get curls with a hot air brush, but get waves and volume instead.